The Thirteen Towers of Chankillo form a toothed horizon atop a low ridge in north coastal Peru. Archaeologists have discovered that the 2,300-year-old stone towers are part of an ancient solar observatory. Image is courtesy of Ivan Ghezzi. A line of 2,300-year-old stone towers north of Lima, Peru, form the oldest known solar observatory in the Americas, a team of archaeologists has found. The discovery that the line of stone markers tracks the sun's progress across the sky also suggests that sophisticated sun worship may have thrived in the region nearly two millennia prior to the famous sun cults of the Incas, the team says. Known as the Thirteen Towers of Chankillo, the structures sit atop a low ridge in north coastal Peru, part of a ceremonial complex dating to the 4th century B.C. Ranging from 2 to 6 meters high, the towers form a toothed horizon along the ridge. The 4-square-kilometer site also contains multiple structures and plazas, including two structures that precisely flank the towers to the east and west. Earlier excavations uncovered pottery, shells and stone fragments littering the site around one of the structures. Archaeologists have known of the site since the 19th century, but rather than linking it to the path of the sun, researchers originally thought it tracked the moon's movement. 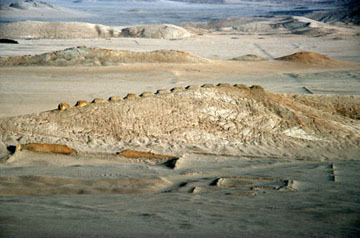 Ivan Ghezzi, director of the National Institute of Culture in Peru, wanted to investigate the site further, however. Taking the evidence of shells and pottery as suggestive of rituals, Ghezzi and archaeoastronomer Clive Ruggles of the University of Leicester postulated that the two flanking structures might be observing points from which the people could examine the towers. The team then compared the towers' locations with the sun's position throughout the year, including a precise calibration to the sun's position during the June and December solstices in 300 B.C. Viewed from either observing point, the spread of the towers precisely follows the full range of movement of the sun, tracking its progress accurately to within two to three days, Ghezzi and Ruggles reported March 2 in Science. During the winter and summer solstices, the sun's position was also symmetrical, setting on either end of the line of towers when viewed from the opposite observing points. Furthermore, the regularly spaced gaps between the towers suggest the structures' arrangement may have been used to count off the days of a solar calendar, the team said. The fortified temple at Chankillo, where the ancient observatory was found. Image is courtesy of Servicio Aerofotografico Nacional, Peru. How such a calendar might have been used  whether for religious or other purposes  is difficult to interpret from the data, the authors wrote. It is possible, however, that the restricted entry to the observing points and the discovery of ceramic warrior figurines at Chankillo, possibly representing an elite class, together suggest a link between these solar observations and ritualistic practices, the researchers reported. Whatever their purpose, the towers suggest that sophisticated solar observation existed thousands of years before the Incas used it, Ghezzi says. "Now we know these practices are quite a bit older, and were highly developed by Chankillo's time," he says. "Chankillo was built approximately 1,700 years before the Incas began their expansion." It can be tempting to impose astronomical predictions on archaeological sites, even with scant evidence, says J. McKim Malville, an archaeologist at the University of Chicago. Sites such as Chankillo, for example, may reveal "more about the thinking of the people and their search for meaning" than provide definitive evidence of astronomical observations, he says. 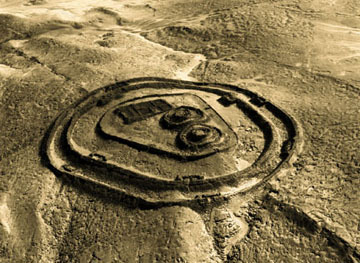 Still, "the powerful role of astronomy at Chankillo as revealed in the sometimes very inscrutable archaeological record is unusually compelling for such an early date." That the towers' alignment corresponded well with the summer and winter solstices is one strong line of evidence that lends validity to the researchers' conclusions, says Brian Bauer, an archaeologist at the University of Illinois at Chicago. "A solstice is very important, and very noticeable to any society that is outdoors," Bauer says. "I review a lot of papers like this, and most of them are not that substantial in the evidence. But this one is terrific." Other researchers are not entirely convinced of the team's conclusions, however. Although architecture played an extremely important role in formal activities for the people of this area and time, the architecture of these "sighting stations" does not appear to be highly elaborate, say anthropologists Thomas and Shelia Pozorski of the University of Texas-Pan American. The site may have held some ritualistic significance, but "we need to see more convincing evidence of this," Thomas Pozorski says. Whether it proves to have ritualistic significance or not, the site will be an interesting place of future study, Malville says. "There is much more to be read in the archaeological record," he says.